Nepali pizza called chatamari is a beloved street food. It is easy to see why. It has a perfectly crunchy pizza crust made of rice flour. 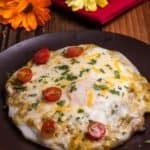 The topping can be anything from vegetarian style just with onions, and tomatoes or often it is made with some type of minced meat like buffalo or chicken along with the onions. 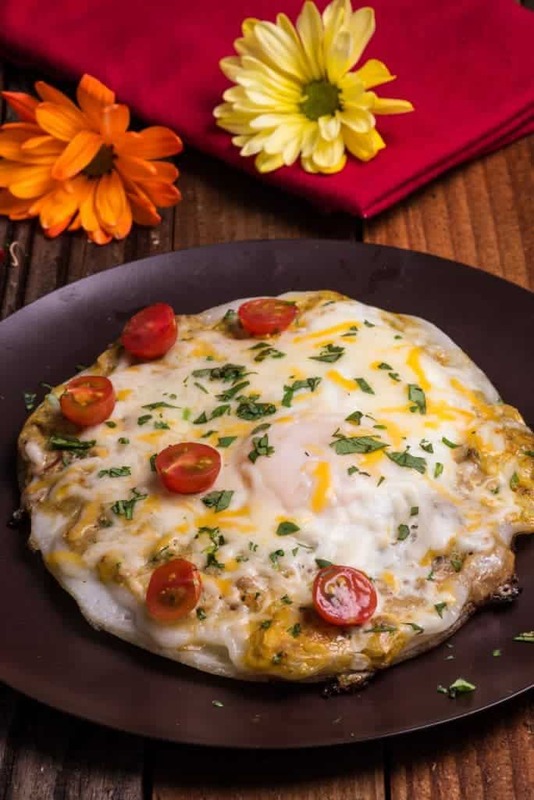 It also is topped with some cheese and an egg. The chatamari is cooked on the stove top all at once and only takes a quick 7-8 minutes. I think this could be the new rage. The mixture that is put on top of the pizza is seasoned with all those delicious Nepalese spices including some red chili powder and a fresh chili for a touch of heat. In a bowl mix together rice flour and water until you get a thin batter but not too watery. Add water slowly and more if needed. In another bowl mix together the meat if using, onion, cilantro, cumin-coriander powder, turmeric powder, chili powder, pepper, salt, ginger-garlic paste, serrano and two eggs. In a skillet that has a lid, heat a tablespoon of oil to medium high heat. A non-stick pan works great for this. Pour the batter to make a 6 inch circle like a pancake. Break a whole egg on top.